We met in our calculus class in Stuyvvesant High School in 2001. We learned that “you plus me equals us” (and some calculus). We stayed together throughout college in Binghamton University, where we had both signed our lives away to engineering programs. It helped to decompress after a crazy day of partial differential equations and fluid dynamics with late-night Denny’s and bubble tea runs. 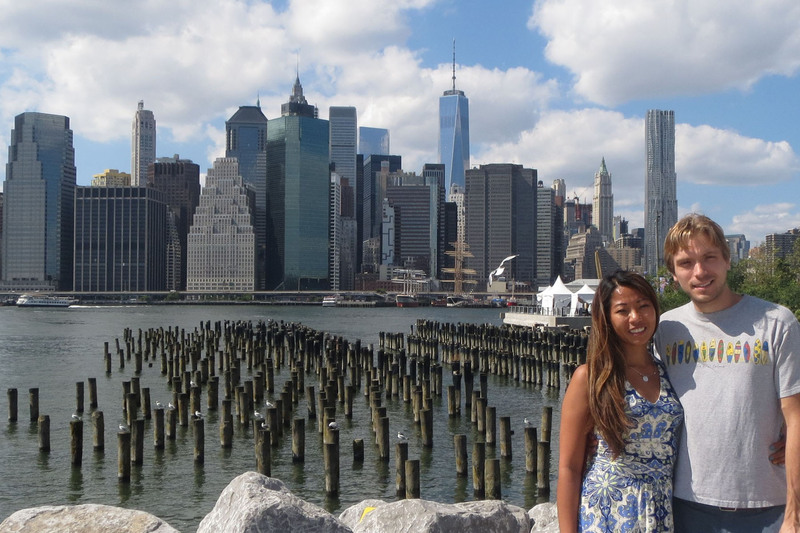 We came back home to New York City after college to work in the financial industry (of course that makes sense) – Jean in a financial software company and Ryan as a project manager for a bank. We eventually moved into the same neighborhood in downtown Manhattan where we first met. We love our long walks to the grocery store and cooking together. We’ve shared many more interests together over the years, one of which is travelling. Our photo above (from Florence, Italy) is flanked by four of the many, many places we’ve travelled to. From left to right, 1. Curacao 2. Kaui, Hawaii 3. The Grand Canyon 4. Yosemite, California. We also love to ski and paddle board.